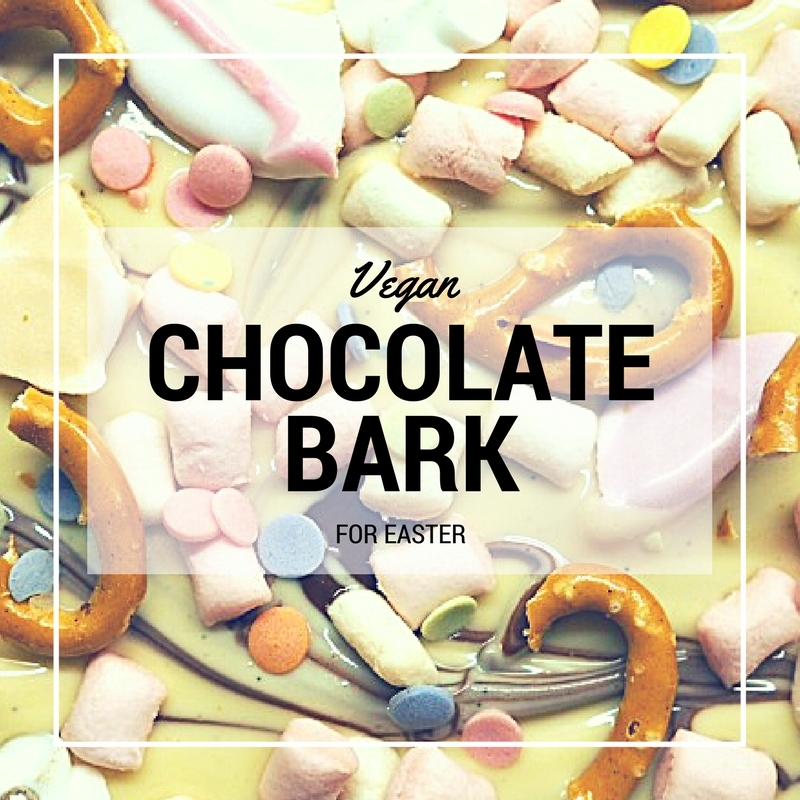 I’ve seen chocolate bark all over pinterest in the last few years, especially at Easter and have wanted to try it but I never got round to it before adopting a vegan diet. I thought it was a chance lost until I did some research and shopping around and realised that I could still make some. It’s also a great recipe if your children are dairy free as they don’t have to miss out. 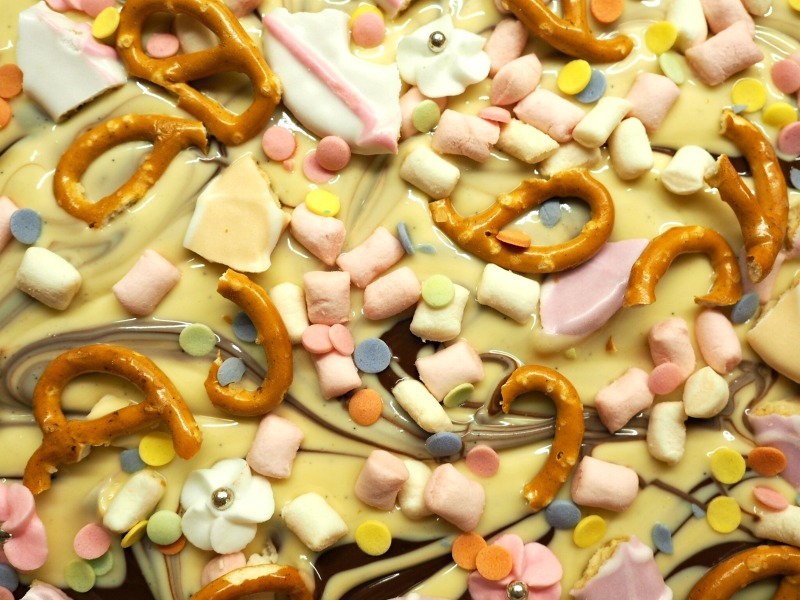 So you may have looked at the photo and seen both white chocolate and marshmallows. Dairy free white chocolate? Vegan marshmallows? Yes to both. 2 large bars of Bournville Dark Chocolate – it’s one of the ‘lightest’ dark chocolates and my son has never really noticed or mentioned that it is any different to milk chocolate. 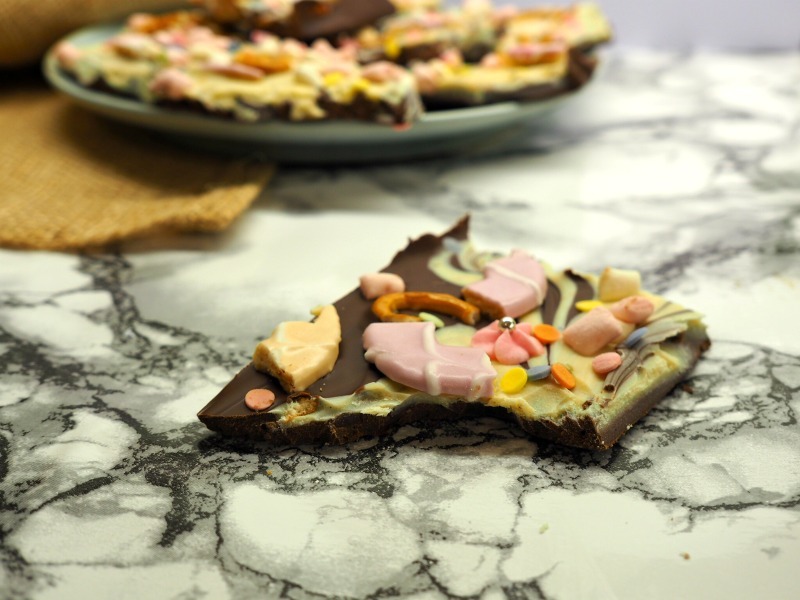 5 bars of Tesco Free From White Chocolate – it doesn’t taste exactly the same as milk white chocolate and you don’t taste it so much in this recipe but it’s great for marbling and being a good background to the colourful ingredients. Freedom Confectionary Mini Marshmallows – I bought these in Holland & Barrett . Fox’s Party Rings that were once not even vegetarian, are now accidentally vegan. Yum. Cake Angels Icing Flowers are NOT VEGAN but ARE DAIRY FREE. Bear was desperate to add them to the bark and he’s not Vegan, I let him. Obviously omit these if like me, you are Vegan as they contain egg white powder. We added sprinkles to our bark as well. Sprinkles are hard when you’re vegan. You just need to check the ingredients well as you can find them that no longer use cochineal (colour derived from beetles) or a beeswax glaze, it just takes a little longer. 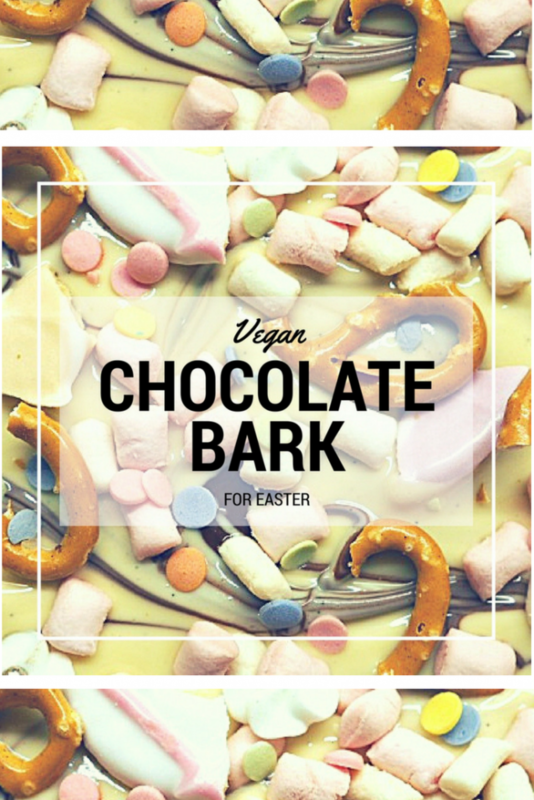 You can add whatever you like to this bark, your dietary choices or restrictions are the only thing that need guide you! The beauty of this ‘recipe’ is that it is so easy. To melt the chocolate, I filled a pan with hot water, placed the bowl of chocolate on top and Bear stirred each one until it was fully melted. Whilst this was happening, I lined a small baking tray with greaseproof paper. Next, we poured the Bournville chocolate into the tray, tapped it to level the chocolate and then spooned the white chocolate on top. I gave Bear a chopstick and asked him to swirl it around, mixing the two chocolates. Then, pop it in the fridge to cool and set, take it out of the tray and break up into as many pieces as you’d like, before sharing. I know, strange concept. Who shares chocolate? A Mum who didn’t hide it fast enough, that’s who. 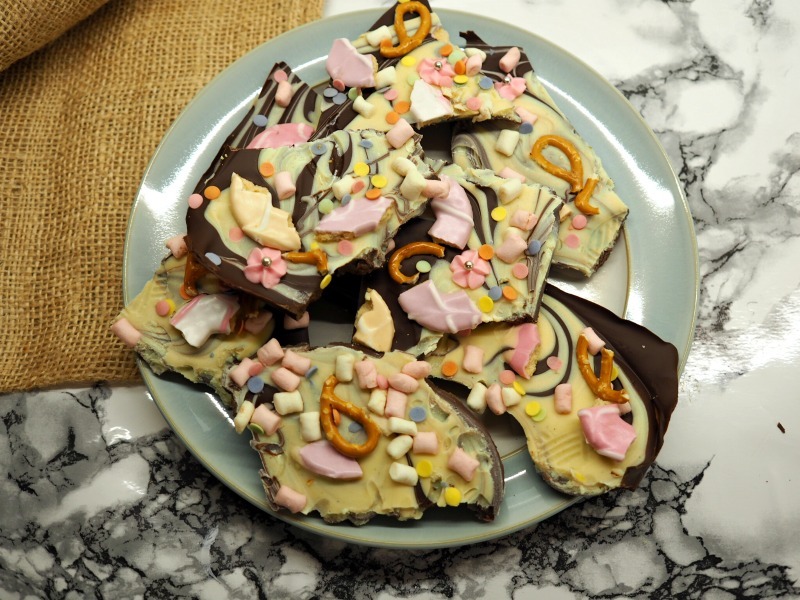 We hope you like this idea for Vegan / Dairy Free Easter Bark and get the chance to make it. It was delicious, and I know you have requests. From the family to make more! 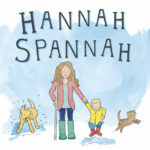 Looks fab, thanks Hannah. I’ll give it a go! That looks great. I want to try some! Thanks Hannah. I’ll try do this for my family at weekend.